It certainly is not easy to eat LCHF in the US. This is a good example. Beef jerky, dried meat, that must be a perfect low carb snack if you need one, right? Reading the nutrition panel this dried meat turns out to be a real trap for a strict low carber. This tiny three ounce bag counts as three servings. So those five grams of carbs turns out to be fifteen grams in reality. And it’s not any old carbs. It’s pure sugar. 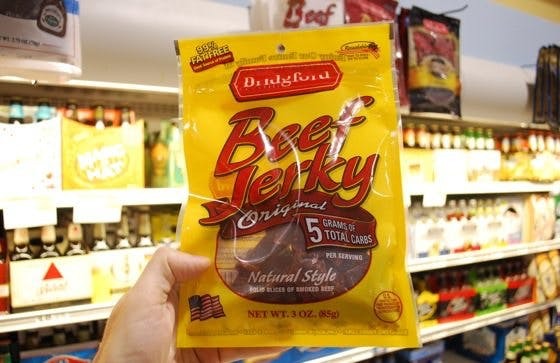 Almost half the energy in this bag of dried meat comes from added sugar. That’s just sick. This isn’t low carb – it’s high sugar. If you would eat 2 500 calories of this dried meat (what you may need in a day) you would get 250 grams of pure sugar. That’s the amount you would get from drinking 2.5 litres (84 oz) of soda. Its not easy to eat LCHF in the US. It is definitely difficult to eat LCHF here in the U.S., especially if you are purchasing any type of packaged food. 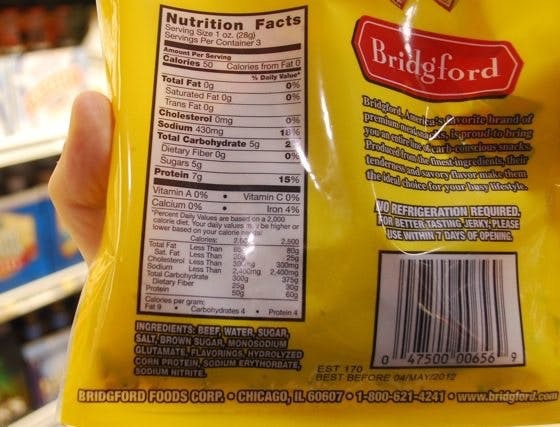 I recently noticed that a boxed variety of chicken stock I had bought contained both added sugar and HFCS. I had never thought about sugar being added to savory products before...so I started digging through my pantry. Almost every form of packaged/canned food I had on hand had added sugars. It seems to be snuck into almost everything. I have almost no packaged foods in my house, not even ketchup. I have found it is easy to make these things. I can whip up a batch of Mayonnaise (made with 1/2 and 1/2 cocoanut oil and evoo) in about 3 minutes. The thought of store mayonnaise makes me feel sick to my stomach. I make my own broth, barbeque sauce, etc. When I really started looking at the labels I was amazed at how much sugar is packed into foods where you would not expect it. It is really quite frustrating. LCHF is hard when you're eating anything in a box or a bag. It's hard, but it's worth the effort to make all of your food...Even jerky can be home made. It doesn't last quite as long as the processed stuff, but that's probably a good thing, right? I think you've made a bit of an error interpreting the numbers. it basically says all the carbs in the pack are from sugars i.e.- 5 gms. But the percentage is referring to percentage of the DAILY VALUES of sugars a person SHOULD be consuming. So therefore, the total daily amount of sugar you should be consuming is 10 gms. That doesn't mean half of each jerky is sugar. I make my own jerky using a food dehydrator. Marinate it in some soy sauce, worcestershire sauce, onion powder and garlic powder for 2 hours first, and it turns out great. It will certainly last a couple of weeks, if it hasn't all been eaten by then of course! #6 If you look at the label it says 0 gram fat 5 gram sugar and 7 gram protein per serving - ie almost as much sugar as protein and no fat makes it almost 50% sugar when you remove the remaining water. Low carbing often refer to energy % of different nutrients and in that aspect a product like this is a disaster in where the energy comes from. The label also doesn´t say anything that the sugar is part of any daily intake - it says that the carbs in total is 2% of that - meaning that they indicate that you should eat 250 grams of carbs a day - obviously nothing anyone on low carb would agree on. No idea what label you actually looked at - surely not the one on picture in the post. It's amazing how much sugar there is in everything - if you're not really scrupulous about scrutinizing all labels, it's easy to get fooled. I'm having to retrain my hubs to look more closely at labels; he recently brought home Worcestershire sauce, and like the 3rd ingredient was High Fructose Corn Syrup. I had beef jerky here in the UK after someone insisting I'd try some "macho meat". Was surprised by the sweet taste - no wonder with more than 20% sugar! I think in general, anything that is labelled "healthy" really is the opposite. I was in Canada the other year and went to a store of a Chinese-food grocery chain called T & T. I wanted some low-carbohydrate snack food, and went for the dried squid. Bad choice! All but one of a dozen brands had sugar as the second biggest ingredient. I can't understand why anyone would want sugary squid, and I wonder how obese the Chinese will get if with prosperity comes more consumption of sugary snack food. In the US, one's better off with fatty sausage sticks as a snack food than beef jerky. The meat is usually a mix of pork and poultry and sometimes beef, usually in a casing made of reconstituted collagen, but there usually is a fair amount of animal fat and not much sugar. Another choice is pork rinds, although the more puffy varieties resemble packing foam in texture, and the flavoring sometimes includes a lot of sugar and maltodextrin. I stay away from the Jerky but keep some Hormel sliced Pepperoni in the refrigerator for when we need to grab something in a hurry. It's insane! They add sugar to almost everything here in the US. Sadly, most don't look at the labels and they think they are eating healthy food. "It certainly is not easy to eat LCHF in the US." I have to respectfully disagree, Andreas. I think that a major problem is that people think that eating low carb means buying "low carb products". On a forum the other day, a person said it was too hard to eat low carb in her town because there are no low carb foods at her grocery store. No low carb foods? Really? How about beef, chicken and fish? And vegetables, fruit, nuts and seeds? Is there no butter at her store? Are there no eggs? Watch out for Worcestershire sauce. I read the label on our store-brand stuff in the fridge and there is NO anchovy in it and it contains sugar. Do not count on even things like oils and sauces being real. I hear they're adulterating olive oil too. Rebecca: No kidding. Kinda like the folks who say it's hard to eat "gluten-free." I'm like... "Meat's gluten-free! Fruits and veggies are gluten-free! What's the problem?" What they mean is gluten-free bread and pasta. Because we all know bread and pasta are REQUIRED foods for good health. The USDA said so! It's hard to eat low carb, high fat in the U.S. if and only if you're relying on packaged (processed foods.) Too many people immediately want to find "low carb" convenience (processed) substitutes for the high carb foods they used to eat. There is a mind set that needs to change. Yes, low carb, high fat means that you'll probably have to spend a bit more time in the kitchen than you did when you ate boxed cereal and those "diet" low fat TV dinners, as many of us did prior to turning to LCHF. But, it's worth it! Eating real, whole foods (meats, eggs, vegetables, nuts, etc.) rather than "low carb" tortillas, bagels, beer, sauces and so forth is the way to go. It's the way to ultimately get the real health benefits of LCHF. The time you lose in the kitchen, you gain in the store! Because one goes directly to those areas wher they have the dairys, fresh meat, fresh vegetables, egg, butter and so on. You can make your own jerky. and many other LCHF treats. No need to rely on packaged foods at all. Why am I not surprised by this product? I just saw "Fed Up" and found out that the "nutrition" labels on products in the U.S. do not contain the percentage of sugar for each serving. We here in the U.S. should demand better than this. No wonder that one-third of adults here are obese with the children not far behind. It sickens me to see this. There is a better way (LCHF) which is easy and allows you to follow the concept of JERF (Just Eat Real Food). Keep up the great work, Dr. Eenfeld. Because of your work, Dreamfield's finally had to pay a fine. People are obese because they are uneducated about proper nutrition. Many have the misconception that it's expensive to eat a nutritious meal as opposed to McDonald's. Also, the social environments play a huge part in determining what's available to eat. If the neighborhood has numerous posters of fast food on buses and buildings, it's easy access. If the parents are children having children, then there is no guidance by example. One of the most crucial reasons why people overeat is dissatisfaction with their lives. If given the choice of eating a nutritious meal of roast chicken, cauliflower mashed "potatoes" or a cheesesteak hoagie, fries, and a large soda or milk shake, which one do you think would do the best job of pushing down the hurt? Which of these meals seems "more fun". I believe people are obese because they are improperly educated about nutrition. Although this is just a slight adjustment to your view, the important difference is that we should instinctively know what real food is for us. All animals know. It seems that in the "civilized" world we happily forget about our instincts when hearing the "wise" advices from "experts" on what to eat to avoid diseases developing. It is always fear based on what people can be influenced the most. I live in the southwest and we make jerky at home with a dehydrator. Cut very thinly and cured in green chili without any sugar added. Very yummy. You're being histrionic. Each bag of this jerky has 1 tablespoon of sugar. As I recall, low carb isn't no carb. Even in the strictest low carb diets, you get 30 grams a day of carbs. The author states that eating 2500 calories of jerky equates to 250 grams of sugar.... Except that is 50 servings.... 16 bags of jerky.... No normal person is going to eat that much. Jerky is a snack food, but the author treats it like a meal. Lousy article full of strawmen. I disagree. The problem with processed foods in America is that it always has to be sweet. I recall a work colleague of mine from France who can't eat anything that comes out of a supermarket, because it is too sweet. Pickles have sugar, spaghetti sauce has sugar, soup has sugar, plain whole wheat bread has sugar, mustard has sugar, just about everything EVERYTHING made in America and placed on a supermarket shelf has sugar. It's crazy. I LOVE going to supermarkets in France...nothing has sugar in it...except of course some obvious foods (like jam). Everything else is sugar free....and absolutely delicious!!!! So, no it is not histrionic babble. No reason to put sugar and brown sugar, and the other chemical flavour enhancer crap, on the jerky. And yes...good plain jerky made from nothing but meat and salt DOES exist. And it's delicious. Perhaps not delicious to the weak palates of the sugaraholic Americans....but, heh...what can you do about it...they will possibly eventually lose their teeth and become diabetic...and jerky will likely no longer be their go-to food anyway. Bon apetit...enjoy your sugar. No, Michael. The strictest low carb diets allow 20 grams of carbs, not 30. Quite a big difference there percentage wise. Low carb dieters should be getting those carbs from vegetables, low carb fruits like some berries and nuts, not from refined sugars.